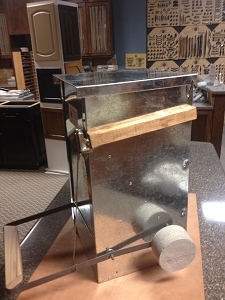 This is the soft close version of our interior rated rat proof chicken feeder in a two pack for 23% cheaper shipping. There is an exterior soft close version as well that is $5.00 more per feeder. There have been thousands of the original feeders sold but one of the complaints was that the door closed so loudly and it delayed training for some flocks. Now if people followed the training instructions the birds learned to use the feeder despite the noise and a lot of people remarked that the sound of the door closing allowed them to know that the feeders were working without having to go into the coop. But people kept asking so we finally made a soft close version. The Soft Close mechanism needs installed once you unbox the feeder but it is a two minute job once you have all the tools gathered. Tools needed: Philips screwdriver or bit and a cordless screwdriver or a power drill. There won't be any reviews on this item because it is a multi pack, only about one out of twenty customers will leave reviews even on purchases they liked, so please read the reviews on the very popular medium feeder by clicking here.. The mechanism is a Grass Corporation cabinet door soft close cylinder mounted on a wooden bar. It is easy to install (the soft close cylinder is mounted on the wooden bar but everything is inside the feeder and it needs two screws installed for installation as part of the assembly), it is adjustable, the cylinder can be replaced should it ever wear out or fail, and installation and tweaking won't take five minutes once you have the tools gathered. There is listing for a retro fit soft close kit and it has a video showing how to install the soft close kit on a new or old feeder. Here is a link to that video. You will need a screwdriver with a Philip's bit, either manual or cordless, and you will need a crescent wrench to bend the door axle if it doesn't line up. When you order the new soft close feeder the holes in the feeder side are pre drilled but you will need to drive the screws into the wooden bar as part of the assembly process. 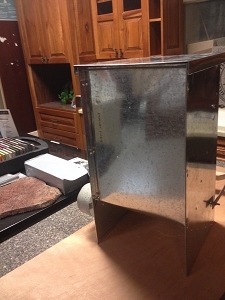 The shipping on the feeders isn't cheap because they are two cubic feet each and weigh 15 pounds. Local states should cost $16.00 to $21.00 and the furthest states will run up to $25.00 or $28.00. But using our multi pack deals you can get feeders delivered to California as low as $9 to $12 each depending on size. We now have USPS enabled on the shopping cart for Post Office order to Alaska and Hawaii. International orders must be handled through a forwarding service as the paperwork is quite burdensome for even a small package. Search online for package forwarding services, they will accept packages in your name, then bundle everything together and process the paperwork for exporting. Alternately, have the product shipped to a friend in the U.S. and take it back with you in your luggage when you visit. One thing to consider on international sales is that you can pack about five to nine pounds of additional product into the inside cavity of the feeder, most forwarders will consolidate packages if you ask, just make sure it will fit inside. The soft close mechanism is pre mounted on a wooden bar and the holes in the side of the feeder are pre drilled but you will need to install the two Philips screws, adjust the closing speed screw, and maybe bend the door axle crank if it doesn't line up perfectly. A crescent wrench and a philips screwdriver are needed for the five minute installation. Check this video for information on installing the Soft Close bar. The holes are pre drilled in the feeder but you will need to screw the two wood screws into the wooden bar. First check out our multi pack deals to get much cheaper shipping. 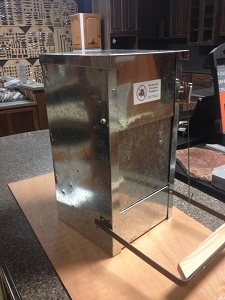 This feeder is radically different from the other feeders for five main reasons. First, the door is soft close so it closes quietly. Second, no plastic parts that rats will eventuality chew through. Third, the treadle is set way back on purpose so that if a critter or a pack of critters managed to get the treadle down when they went forward to eat they would lose the leverage and the door would close. Fourth, the door is spring loaded so it is nearly impossible for several rats to push it open. A dozen might do that, four or five couldn't. Fifth, the entire treadle and door is counter weighted at considerable expense with a 2# counterweight that ensures the door always opens and always closes. It also has a one piece steel treadle that won't flex and break like the riveted aluminum or plastic treadles. The Feed o Matic is the green plastic top and plastic feed tray feeder sold on Amazon and several other websites by re-sellers. The 26 pound model sells for $95.99, 67% higher than our feeder, but they do offer free shipping. Now the average feeder shipping is around $22.00 so the rest goes toward paying the enormous Amazon fees and percentages. The feeders are made in Holland by a company called Olba and after lackluster sales in the EU due to design flaws they started dumping them on the U.S. to get rid of them. You can buy pallets of them and there are many re sellers of the product. 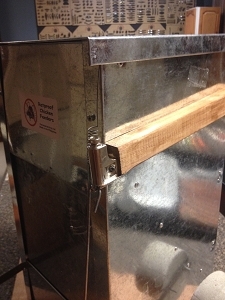 One re-seller, Hog Slat, posts a warning in bright red text stating that rats can push the door open and that rats can chew through the plastic feed tray and lid. The treadle is way too large, rodents or pigeons can swarm the feeder and hold the door open. It is made for smaller birds, too small for Rhode Island Reds, lots of complaints on the Amazon shopping cart page, around 30% of the reviews are critical of the product for a wide variety of reasons. Not only that, but the initial reviews all have a disclaimer that said they received the product for free in return for their review! Amazon recently made that illegal and grounds for banning the company from Amazon. The treadle on this feeder can also be jammed if the litter builds up or if the birds track a lot of chicken poop on the treadle. And the door isn't spring loaded so rats and even small mice can easily enter the door just by pushing on it. They advocate blocking the feeder open while training and customer reviews say it can take several weeks sometimes to train their birds. That is because blocking a feeder open is the worst thing to do during training because it teaches the birds that the treadle and door are not supposed to move. The Feed o Matic jams a lot according to the reviews, especially when the treadle is blocked open. One review said the feeder leaked and their feed was molding. Other reviews say the birds don't like sticking their heads so deep into the machine. With a critical review rate of 30% this product won't last long on Amazon before Amazon pulls it from the market. Here is a link to the reviews both positive and negative.